First, you need to drain your tofu from the package. Then wrap it in a clean towel and place in a glass baking dish. Place something heavy on top of it like a cast iron pan. After about 40 minutes, remove the tofu from the soaking towel. Then slice into 9 cubes. In the meantime, whisk the other ingredients into a tupperware container. Then add the tofu. Gently turn the container over to coat the tofu evenly. I place in the fridge and rotate the container to get all of the pieces tossed to coat. I serve at room temperature with crusty bread, as a salad topper, as a main dish or however you like. Summer heat & humidity has arrived much to my running dismay. Today’s run was killer. My heart rate was over 220 and I felt every step. Is it wrong that I’m looking forward to crisp fall morning runs already? Ha ha. I will stop whining now. That’s it from here. Enjoy the sunshine! oh this looks good! and I’m already ready for fall too!!! bring it on! Hey woman! This looks fabuloso! What brand of tofu did you use here? I love it made most ways but to me, the brand and type are important depending on the recipe. That being said, I usually prefer silken. 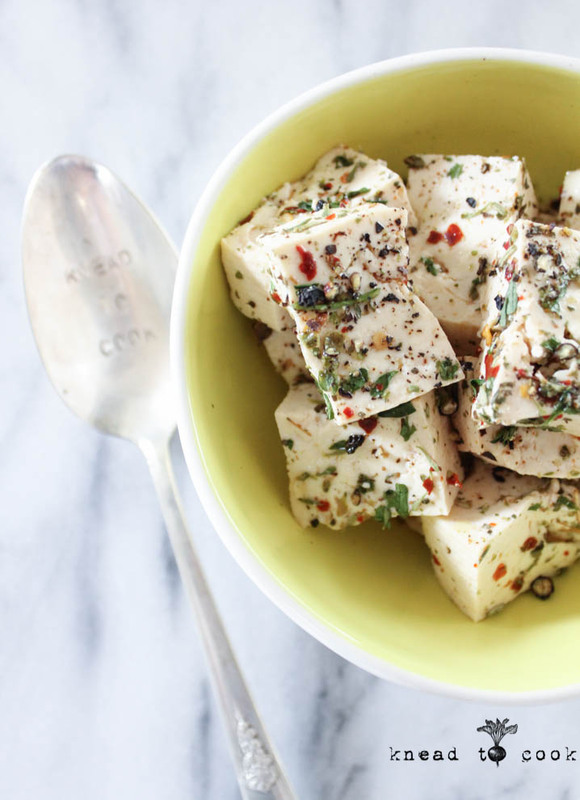 I am loving this and for a tofu disliker… that’s a win 🙂 ha ha. I hope you love it.